Supplied: In a 3 litre container of peat-free compost, healthy and well established, approximately 60-90cm (3 feet) high, with full planting and aftercare instructions. There can be few finer sights and scents in any garden than that of an apple tree in full blossom. Malus 'Evereste' is one of the finest small flowering trees with long seasons of interest and a tidy compact essentially conical habit - some of the many reasons why I selected 'Evereste' as the first crab apple to grow on the nursery. The fun starts in early spring when a profusion of flowers are borne, initially red in bud before opening to glorious large white blossom. Dark green almost lobed leaves emerge as the flowers fade. Come September not only do you get a good display of autumn foliage, but moreover masses of red flushed orange yellow crab apples appear, that so closely mimic baby 'Gala' apples you inevitability have to bite into one - superb for crab apple jelly or chutney, not so good for eating raw!! The remaining crab apples that stay on the tree do so well into the winter, looking great on frosty mornings until eaten by the birds. 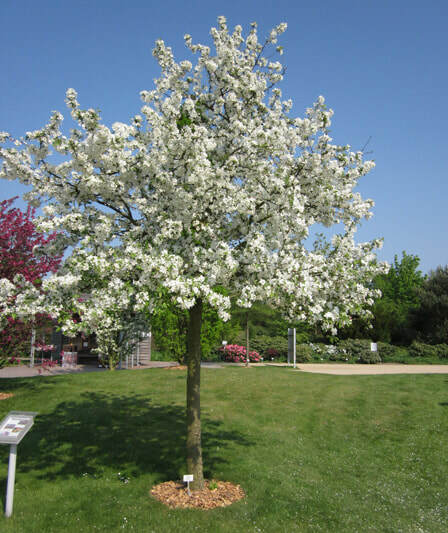 Malus 'Evereste' is easy to grow and performs well on any reasonable garden soil. 'Evereste' has proven to tolerate air pollution and is ideal for small roadside front gardens. 'Evereste' is also an excellent pollinator for other fruit trees. A highly recommended tree that can be used in a wide range of gardens and situations bringing brightness and life to each and everyone. Fully hardy.